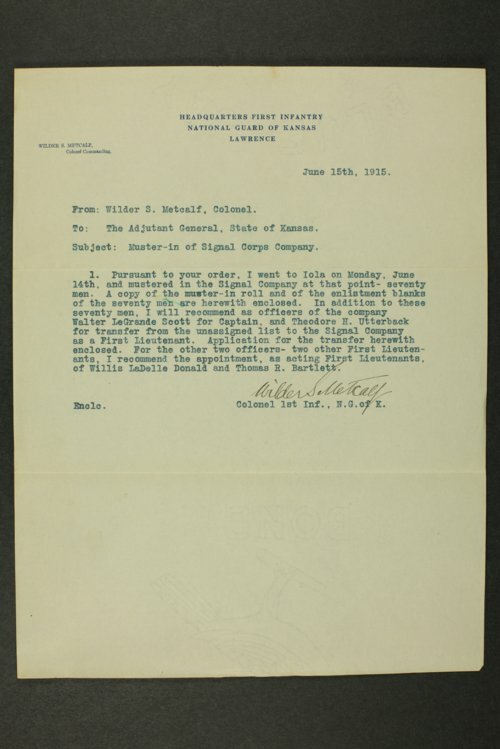 Correspondence including general orders from Adjutant General Charles I. Martin and telegrams between commanding officers of the Kansas National Guard. Also included are appointments of non-commission officers, strength reports detailing desertions and injuries, and descriptive cards of cavalry horses, including their age, size, purchase date and location. Topics discussed include the recruiting of qualified Kansas National Guard members for service in the regular army, instructions for removing enemy sympathizers within ranks and monitoring German nationals in service, and furloughs or personnel transfers. A payroll list with signatures of received payments for members of Troop B, 1st Squadron, 1st Cavalry, drafted into service on August 5, 1917, can also be found in this material.